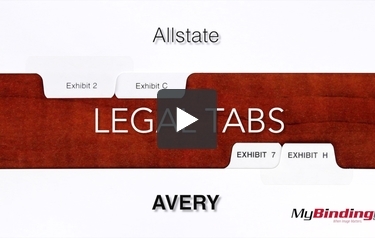 Whether you prefer Avery style or All-State, if your looking for legal index tabs, MyBinding has you covered. We offer both Avery and All-State styles. Avery style are printed on both sides, in bold Helvetica font, in all capitals, All-State style are printed on both sides, in regular Helvetica font, in both upper and lower case. The tabs on the side or bottom of your indexes depending on your choice. There are standard size and legal size indexes available for you to choose from depending on your need.